Want a total body workout that challenges your body, mind, and spirit? We’re not talking yoga, we’re talking American Ninja Warrior Training. American ninja warrior training has become increasingly popular amongst fitness enthusiasts in the midst of the reality television sensation American Ninja Warrior. If you’re ready to put your fitness routine into beast mode, here are the best reasons to train like an American Ninja Warrior. Many people turn to boot camps or crossfit style training when looking for total body – but American Ninja Warrior Training is so much more. You’ll be testing your fitness, athleticism, and will power in a style of fitness training that helps you build functional strength. Strength that you can use over time in a more meaningful way. Ninja boot is a total body experience when it comes to boot camp style training and fitness, and that’s why we love how amazing this style of training is! It’s not just about your physical fitness but your mental fitness, as well. That’s right, you’ll get mentally fit when it comes to American Ninja Warrior Training. You’ll learn concentration and focus so that you can attack every ninja warrior course with a clear mind…which can also help you better handle the other obstacles in your life like personal relationships and even work. Ninja warrior training requires a lot of mental focus and clarity, as you’ll need strength and agility to master all of the warped walls, a sea of swings, and devil steps. Ninja warrior gyms aren’t just for adults either, they even offer ninja warrior gym for kids too! 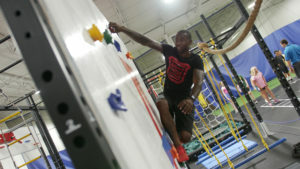 If you’re looking for birthday party places in Michigan, look no further than American Ninja Training & Sports Complex. When you’re looking for an excellent ninja warrior training course or ninja warrior gym – you want one that offers multiple courses. Whether you are a beginner or advanced, you’ll want to set goals for your American Ninja Warrior Training and succeed in reaching those goals. That’s why you should check out American Ninja Training & Sports Complex in Livonia, Michigan. They offer three killer American Warrior Training Courses that help you improve total body strength – both mentally and physically. They’ll even help you throw your child the ninja birthday party of a lifetime, too. With this amazing sports complex, you’ll also get other classes to exercise your muscles and your mind. Are you ready to strengthen your confidence? Sleep better at night? Sharpen your memory? Live happier? 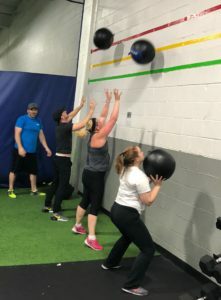 At American Ninja Training & Sports Complex we work with you to design a fitness program that will help you smash your goals day after day, week after week, year after year. When it comes to training, workouts, and staying fit – you always have the choice to throw in the towel, but we’ll teach you how to use it to wipe the sweat off your face!